Streamline your nursery with this compact changing table. 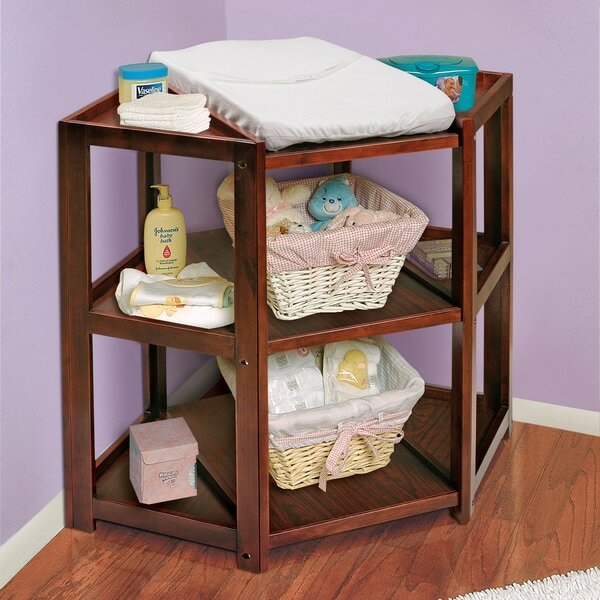 Designed to fit in corners, this table features a cloth pad with a safety strap and two lower shelves to store diapers, linens, and other infant essentials. Changing table can be used with children weighing up to 30 pounds (13.6 kg). Toys, baskets and accessories shown with the table are for illustration purposes only and are not included with the product (except as mentioned above). Because i want to be able to change my baby from the front not the side. it will fit perfectly in the corner and not be as bulky as a normal changing table . "It appears this could be separated into 3 pieces, 2 corner shelves and the middle piece. Are the separate pieces sturdy enough to use alone and then transition it into a changing table when needed later?" "How easy is it to remove the pad and use this as a bookcase? Are there holes when the pad is removed Thanks!"